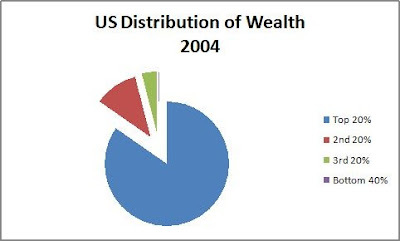 In 2004, the bottom 40% of America controlled only 0.2% of the wealth of this nation. Allowing the tax cuts to expire will not affect the majority of the population and would have have only a minimal effect on top tier earners - small businesses and average Americans would not be harmed in the expiration of the tax cuts. I made that chart with government figures using excel over a year ago. 2004 was the last year I could find complete data on which to base it. Bear in mind, that the situation today is considerably worse, because that chart's data does not reflect the consequences of the Republican plan to such up the last bastion of middle class wealth through the housing bubble.